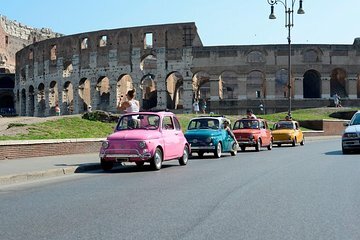 Il tour inizia nel centro di Roma, dove incontrerai la tua guida e ti verrà assegnata la tua Fiat 500, nota anche come la Cinquecento. Introdotta negli anni '50 come mezzo di trasporto elegante e al tempo stesso economico, la Fiat 500 continua a evocare giornate stupende in giro per l'Italia. Sali al volante, ascolta una breve introduzione sulla sicurezza e sui dettagli di funzionamento dei controlli manuali della Fiat. Quindi parti per un giro in città con il tuo gruppo colorato, seguendo l'auto della guida lungo alcune delle strade più tranquille di Roma. Apri il tettuccio per goderti il sole e l'aria fresca, mentre percorri le incantevoli strade di Roma per vedere alcuni dei monumenti più importanti, come il Circo Massimo, il Colosseo, l'Arco di Costantino, la Bocca della Verità. Sosta di tanto in tanto per scattare foto e ascoltare interessanti notizie sulla storia della città da parte della guida. Oltre alle attrazioni più note, ammirerai luoghi meno conosciuti, lungo strade che potrebbero essere inaccessibili a veicoli più grandi; ad esempio: il Giardino degli aranci, il buco della serratura sull'Aventino, Piazza dei Cavalieri di Malta, e il vivace quartiere di Trastevere. Potrai anche fare una sosta per un gelato o un caffè (a proprie spese) prima che il tour termini al punto di partenza. Nota: la Fiat 500 è piccola in confronto alle automobili più moderne, quindi, per garantirti il massimo comfort, le prenotazioni sono consentite per un massimo di tre adulti per auto (o due adulti e due bambini). Se hai un gruppo più numeroso, va bene comunque! Possono prenotare fino a 10 persone alla volta, e sarete divisi in auto separate. Wow. We had a group of 9, took 4 cars and the lead car, so a 5 car caravan. 100% the best time we had in Italy. This is an absolute must book for anyone looking for something out of the ordinary. And the guys who run this, really fun guys. Great, great time. A+++. One of the best tours you can take in Rome. Very fun and unique experience in Rome. Got to see some sites and neighbourhoods that are a bit off the beaten path. Jack was a wonderful and friendly guide. The Roman traffic can definitely live up to its chaotic reputation, so you shouldn't sign up for this is you are a timid driver. By far this was the highlight of my holiday. We had Franco as our tour guide who spoke French and English. He was very accommodating. We drove on the cobble stone roads in a 57 fiat 500. If you love cars then this is a must. Make sure to ask for Franco. I will do this again when I'm in Rome. By far, this Fiat tour was the highlight of our Rome trip! If you can drive a stick - you must take this tour. The tour was amazing. We got to see all the main sites and a lot of out of the way places too. Well worth the money and the guide was excellent. It's a very nice tour with super friendly tour guides who also speak great English. We booked the hidden gems of Rome tour and went to places we normally would not find if we just follow the standard tourist activities. The Fiat is actually a bit roomier on the inside than it looks as we sat pretty comfortable inside. Driving it however is pretty hard. Just take it easy! My wife and I had a wonderful time on this tour, but there is a story.... We had been in Rome for 3 days before we took this tour, lots of walking an cabs. When we arrived for the self-drive tour, the guide told us that the other couples had cancelled and it was just us and him. He asked what we would like to do, drive or have him drive us. I quickly said that he could drive and I would sit I the back seat. What a relief. If you have ever seen the traffic in Rome you would understand my answer. To drive a 1957 Fiat 500 with a 1957 gearbox on hills and cobblestone in traffic so fast and tight and scooter-filled that it would make a Chicago cab driver cry, all while keeping up with another car is a very tall order. Our guide, however, was a great guy and made the tour a great success. He gave meaningful insight into the various stops along the route, and even added an unscheduled stop at Trevi Fountain. With a group of adventurous drivers, I can see where this tour would be a blast. Excellent time great guide !! !